It’s important that everyone knows who, or what, you are, so tell us a little bit about yourself and your history in gaming? By day, I’m a video games designer working on Elite Dangerous at Frontier Developments in Cambridge. At night, at weekends and every other spare minute I get, I work on creating my own RPG game Neon Sanctum. I have been playing role-play, miniature and board games for as long as I can remember. Over the year I’ve played all kinds of games from crunchy dungeon delves to free flowing story games. I remember my brother getting me into games through things like Heroquest and Space Hulk. Wow, working on Elite Dangerous, that’s pretty cool! Why is it do you think that most tabletop game developers do so in their spare time? Why is it so difficult to turn it into a full time job? That is a really tough question I think for us, we started this as a passion project. When we started we didn’t expect this to turn into the project that it has. I think a lot of projects, especially Kickstarter ones are like that, they require so much work and commitment that people really have to love what they are doing. As for the full time job, well I guess that it is probably hard to make enough money unless you are a big company putting out multiple projects. Neon Sanctum, the sc-fi post-apocalyptic RPG that is about to hit Kickstarter, tell us a little bit about Neon Sanctum? 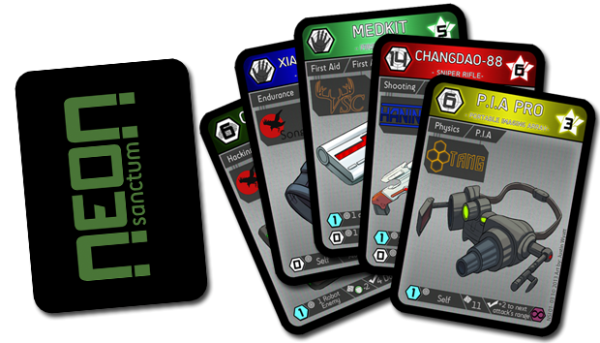 Neon Sanctum is a card based role-playing game set in a cyberpunk world. Two hundred years ago humanity was on the edge of extinction at the hands of an aggressive AI army. Against all the odds, a group of ragtag men and women managed to perform the impossible and win the war in one devastating strike. Unfortunately winning the war came with consequences; huge swathes of the world became deadly to anyone who entered, cutting humanity off from its settlements. In an instant humanity was both saved and condemned. But as it has always done humanity survived, and those survivors built Neon City, a dystopian metropolis populated by powerful corporations, terrifying gangs and mutants. Outside of the city walls, the overgrown wastelands are filled with mutants and bandits, but also the lure of valuable ancient technology. As for the game, it’s a role playing game with a difference – most RPGs provide players with character sheets to store their characters’ skills, items, life, experience etc, but Neon Sanctum uses cards to represent all these things. The use of cards means that the game is really accessible for new players, but we have worked hard to make sure that it still offers the kind of depth that veteran RPG players require. The cards are designed to be tactile, intuitive and immersive. The combination of evocative names and artwork make it easy for players to recognise what each card represents, even before they have read any rules. Neon Sanctum’s unique trait is its card based combat and levelling, tell me how they work. In Neon Sanctum players have a hand of skill cards, instead of a character sheet. Each skill card represents the player’s level in both an ability, and their skill within that ability area. When performing actions, players simply play a relevant skill card and add it’s level to a roll of 2D10 in an attempt to equal a target score set by the DM. These same cards are also powerful abilities that players can choose to use in combat and they also represent the player’s health. So when the player takes damage they lose cards, reducing their options and making combat situations intense tactical battles. The game also has cards to represent mutants, items, cybernetics and for the DM, NPCs. We have found that the cards make the game accessible for novice RPG players, especially those who are used to board or card games. Which came first, the idea for a post-apocalyptic cyber punk rpg or the card based system? The card based system came first, when we first began we made the game work with several modern day or near future settings. So the game was more generic. We made a decision that the game would be stronger with a good setting behind it. In the end I think it’s the right decision as everything in the game, from the art on the cards, to the layout and the adventures all come together as a whole. Are there any plans to translate the card based system, which I think needs a catchy name by the way, into other RPG settings? The cards could easily be used by a DM who wanted to run a modern game or a zombie game just by taking a few cards out of the game. That is one of its strengths, the cards allow the game to be modular. And we know it works because we have done it ourselves. As for official settings, I feel like we have a lot more to explore in Neon Sanctum, for example we want to have level 3 and 4 cards, and those could be stretch goals in the Kickstarter. Of course, having said that, if we were really successful and people really wanted other settings the card based system could easily be modified for fantasy, horror etc. Why did you feel the need to go to Kickstarter, did you ever consider just releasing the game on Drive Thru RPG and getting into gamers’ hands earlier? The playtest kit is already available on Drive Thru RPG for free now, so if you want to grab it, you can do so here. Over 1000 people have downloaded the playtest kit so far, which I find encouraging and it’s great to get feedback on the game! But we hope that Kickstarter funding will allow us to make the game available internationally, will enable us to create cool add-ons such as extra cards through stretch goals, and most importantly will bring the game to a wider audience. 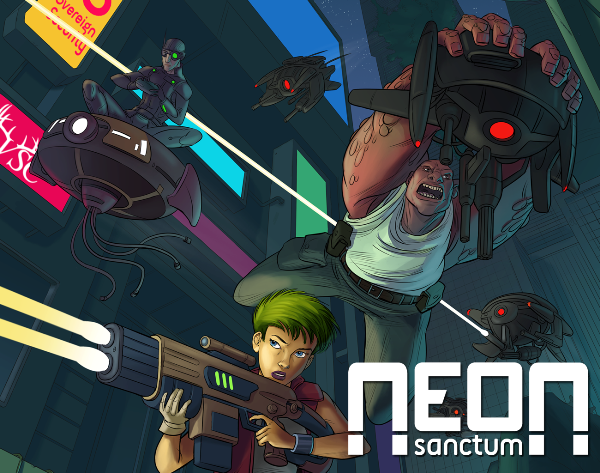 We want to build a community of people who play and love Neon Sanctum as much as we do. Our plan is to sell the game as a package with everything a group of players need to play the game, and we quite simply don’t have the money needed to print and ship the game by ourselves. How valuable was the feedback? Have you altered the game much based on what the players have said? The game has changed a lot since its early days and that is because of the feedback we have received. Everything from the card layout to how death works has been made better due to people giving us honest feedback. It’s not always easy to take but it has been really important that we have looked at every comment and considered its virtues. Obviously we didn’t make every change that was suggested, but we have made a huge amount. We’ve talked about the mechanics, tell us a little bit about Neon Sanctum’s setting and what was its inspiration? I’ve always been inspired by post-apocalypse sci-fi settings, and the genre seems to be recapturing peoples’ imaginations – for example, Hollywood remakes of Judge Dredd, RoboCop, and the Mad Max game coming out. I wanted the game to focus less on how the world ended, and instead on the challenges that would face the humans who survived and rebuilt their world. The setting asks players to think about how humanity has rebuilt so quickly, and the impact that has on the culture of the world. We have decided that the control of resources became a critical part of everyday life, with corporations seizing all the power and taking the place of nations in a desperate grab for resources. Of course that has led to a huge gap between the very wealthy and the very poor, something that is a real issue in our world too. Sounds pretty cool - that spell mechanic is quite nifty too.